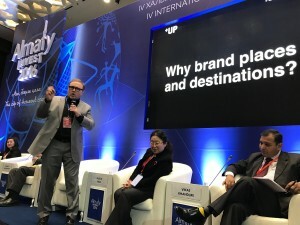 Speech on Place Branding with Ken Livingstone, at Almaty Invest 2016, Kazakhstan. December 8th 2016. Gave a keynote speech today on Place Branding & Marketing at the Almaty Invest Forum 2016. First time in Kazakhstan and what an interesting place. Not what I exected at all and a very enjoyable time. The other speaker with me was Ken Livingstone, ex-Mayor of London. Good speaker, interesting views. We talked about the significance of cities vs countries and how cities are actually much more dynamic than nation states in responding to peoples needs and managing the big issues. Think London, Amsterdam, New York, Stockholm. Cities are in some respects more important than countries now. Its a topic he has agreed to be a speaker about on one of our regular UP Place Branding Podcasts – so watch this space. Will be a great topic.